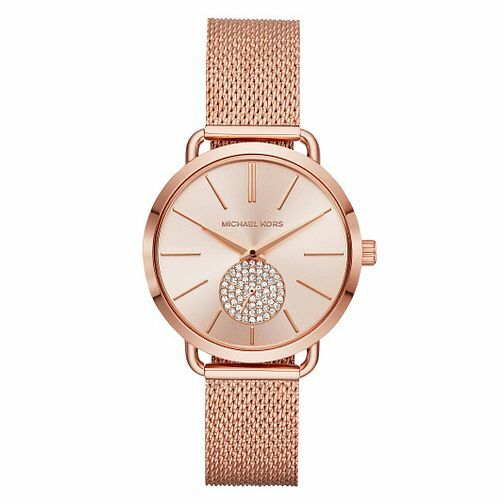 Give your wristwear an edge of understated glamour with this sparkling timepiece by Michael Kors. A rose gold tone envelops the watch, with a subdial that sparkles with set crystals for an everyday timepiece that is touched with a luxe accent. Michael Kors Portia Ladies' Rose Gold Tone Bracelet Watch is rated 5.0 out of 5 by 1. Rated 5 out of 5 by Anonymous from Quality product Simple design. Great quality. Performs as it should. My wife recieves many compliments for this watch.